This work focuses on corporate social responsibility (CSR) disclosure practices of multinational corporations. 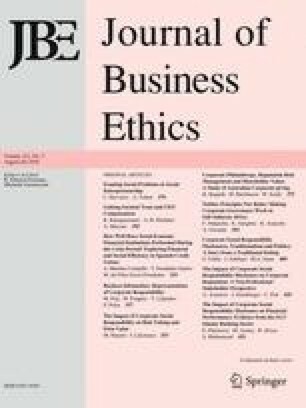 Based on a longitudinal study of CSR reports of companies operating in the automotive industry, the paper offers a detailed study of how disclosure practices are changing and which principles and approaches influence and drive the development of such disclosure. Based on a four-year report-based study, the findings enable us to identify three main trends in the CSR disclosure strategy of automotive firms. First, in line with the mainstream CSR literature, the present study confirms the trend towards the increasing environmental and social accountability. Second, it adds evidence to the emerging debate regarding the harmonization and standardization of reporting and discusses this aspect by mentioning the standards as exerting some normative pressures within the sector. Finally, it provides evidence on specific links emerging between issues and actors. The implications of this evidence contribute to opening up the debate on CSR disclosure to the possibility of combining the institutional lens with a strategic approach that captures the materiality considerations of CSR disclosure. Buck, B., Espinach, L., & Söderberg, S. (2014). GRI G4 guidelines and ISO 26000:2010. How to use the GRI G4 guidelines and ISO 26000 in conjunction, http://www.iso.org/iso/iso-gri-26000_2014-01-28.pdf. McKinsey & Company Inc. (2013). The road to 2020 and beyond: What’s driving the global automotive industry? www.mckinsey.com.